Well, ATCards.com (The Artist Trading Card Forums) and themailartist.com have been shut down. The members have sought refuge at a temporary group on Flickr (you need to have a Flickr ID to join). Right now a lot of folks are volunteering their time and working their butts off to get a new site up and running as early as this coming week. So get ready for http://www.atcsforall.com/ A similar site for the Mail Artist will be going on-line later this year. If you were an ATCards member and want to get on the e-mail update list, send your e-mail and ATCards ID to adriayna @ yahoodotcom. Past updates can be found here. Thanks to Sarah/Original Youth who pitched the idea to Ronna Mogelon, I've got an article about my ATC-a-Day project in the Spring (March 2008) issue of the ATC Quarterly. Last week, on the day of the Big Blizzard, I got an envelope in the mail - my Dia de los Muertos mini-art quilts finally came home from Eugene, Oregon, where they were in the annual Day of the Dead exhibit at the Maude Kerns Art Center. Apparently I'm one of the 5% who get upset stomach from my antibiotic. Blugh. So the day after the Blizzard of '08, I woke up with a sore throat and a fever. That was Thursday, when I had a fever of 102.4 but I figured that was the peak. 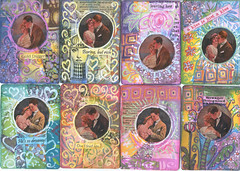 My Crafting 365 project was sketching out some ideas for the art quilt squares I need to make for a swap. Friday, instead of getting better, I managed to reach 102.8. (Crafting 365 - assembling the kits for my Mini-Matchbox Shrine class because obviously I would get better now that I had reached those dizzying heights). Saturday, I woke up at 100 degrees, which was an improvement so I took some aspirin and drove up to Dodge County to teach my class with (I hope) reasonable coherence, and was horrified to discover on my return that my temperature had gone back up to 102 again. Lay down on the couch for the rest of the day. Drank excessive amounts of hot tea or water with lime juice. Glen brought me frozen custard for medicinal purposes (Snicker Swirl). Went to bed at 10 p.m. and finished Yiddish Policemen's Union (good book). Officially got out of bed on Sunday morning around 11:30 a.m. and staggered to the couch to read the paper, and then read Laurie R. King's Touchstone (disappointing), while Glen watched NASCAR coverage. (He did offer to change the channel to whatever I wanted, but NASCAR actually helps me fall asleep with all that driving in circles.) My Crafting 365 entry was "tried to visualize piecing the circle quilt square" which was very difficult even with only a constant 100 degree fever because the circles tended to dance around in my imagination. We did consider my going to Urgent Care on Sunday, but the windchill was in the negative double digits, and I figured I was better off lying on the couch ingesting hot liquids. 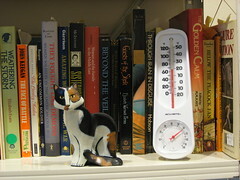 So this morning I woke up at 98.6 degrees on the dot. I'm now at the point where I sound much worse than I feel, and was given orders to take zithromax and mucinex (and I thought they were supposed to be cutting back on antibiotic use). Meanwhile Glen's coming down with something too, but it doesn't seem to be the same thing. Looks like we got over a foot of snow, but it's hard to tell with the drifts! Glen got his car shoveled out and I'll have to finish shoveling mine out of the garage tomorrow. Fun, fun! 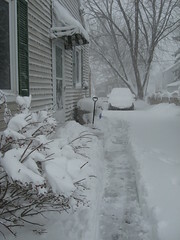 This was our driveway around 2:30 p.m. when he shoveled a path to the mailbox and decided it was too mucky to continue. 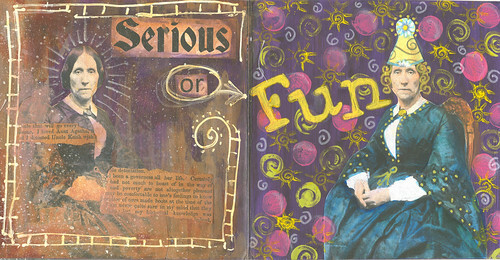 I'm also working my way through Jane Wynn's Altered Curiosities: Assemblage Techniques and Projects, which I have to read one project at a time, or I get overstimulated. Will this be the year I finally learn to use that two-part resin epoxy stuff?? Bedside reading right now is Michael Chabon's The Yiddish Policemen's Union. I've never read any of his work, and I usually don't read Critically Acclaimed Literature, but I was attracted by the premise of a noir murder mystery set in an alternate timeline where displaced Jews end up settling in Alaska rather than Israel after WWII. Old news now - but we did get the latest Pratchett Making Money from my brother and his wife for Christmas (OK, technically it's my husband's copy but I did recommend they get it for him.) I read it very quickly, went back and re-read Going Postal to remind myself where Moist von Lipwig got started, and then re-read Making Money at a more leisurely pace. Over on Flickr, we're showing off our books.